Use these pretty Red Sponge Pattern Address Labels to give your envelopes and packages a tasteful finishing flourish. Inspired by the work of faux finishers, the design features a field of dusty rose tones in a mottled texture. The result is a tasteful and feminine-looking set of return address labels that will save you plenty of time when preparing for a trip to the post office. Thanks to their self-adhesive backing, all you do is peel and stick -- there's no need to lick! Besides identifying your mail, Red Sponge Pattern Address Labels are also a great way to mark other items that belong to you, such as books or DVDs from your lending library, for example. 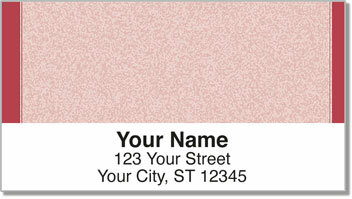 Don't delay -- order your own Red Sponge Pattern Address Labels right away!